This house was built for James Putnam Vye (1880-1955), son of Alexander and Margaret Vye (1785 Carrick), on part of the family’s farm property. James lived here until the early 1920s. 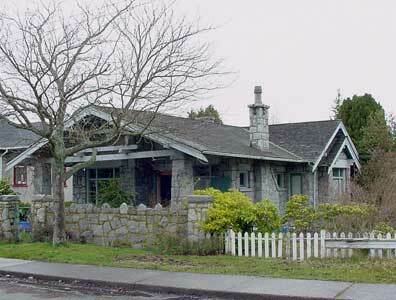 Born in Cape Cove, NS, James came to Victoria with his parents in 1884. James was married three times. In 1910 he married Lillian Young, but they divorced before 1925, when he married Katherine Ann Ingram (1905-1984). They divorced in 1931. He eventually married Grace Mary Hodges. James was a medical doctor for over 30 years and retired in 1949. Pearl Elmer Tergeson (1888-1975) lived here c.1924-31. He operated an automotive parts establishment, The Tyre Shop, with his brother Wallace (1891-1935) for a number of years. Pearl was born in Anoka, MN, to Norwegian parents and came to Victoria in 1912. He eventually married Katherine Ann Ingram, former wife of James Vye. The Colvin family bought this house c.1933, and resided here for about 20 years. Walter Burgess Colvin (1891-1956) and Alberta May James (1894-1975), both born in Victoria, married in 1913. Walter had a lengthy career in the attorney general’s office. He started in 1908 and was chief clerk by 1913. In 1932 he was admitted to the bar and made assistant departmental solicitor. He became solicitor in 1945 and assistant deputy in 1954. During his 48-year career, he served 14 attorneys general. He retired in 1956, and died several months later of a heart attack. He and Alberta had been on vacation in England.